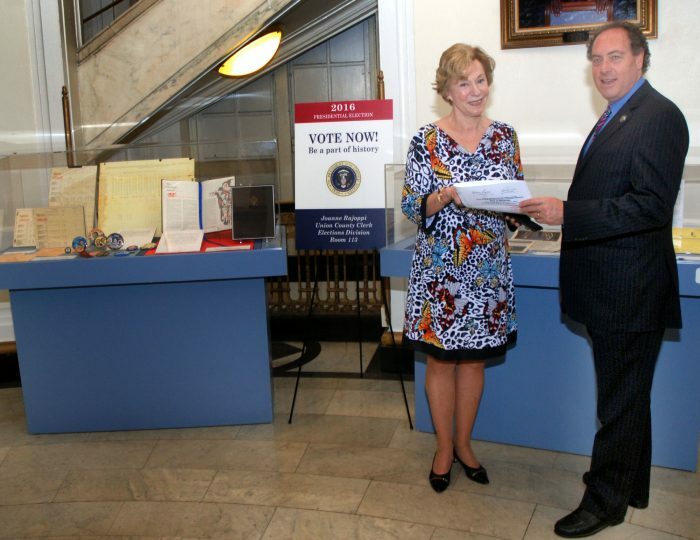 Union County Clerk Joanne Rajoppi speaks with Union County Freeholder Chairman Bruce H. Bergen at the County Clerk’s new exhibit of unique presidential campaign memorabilia from years past in the Union County Courthouse Rotunda in Elizabeth. The exhibit includes campaign buttons, original newspaper clips and historic election results along with ballot memorabilia. The Courthouse Rotunda is a designated historic landmark located at the front of the County Courthouse complex, at 2 Broad Street in the heart of the midtown Elizabeth shopping district. It is easily accessible by mass transit, and ample public parking is located nearby at the J. Christian Bollwage Parking Garage. County Clerk Rajoppi invites members of the public to visit the historic Courthouse Rotunda from now until November. The exhibit is designed to grow as the 2016 election season progresses. Union County residents who would like to contribute their personal memorabilia can contact Donna Connell at 908-527-4787 in the Clerk’s office. For complete details on all County Clerk election services, including Vote-By-Mail deadlines and extended office hours, call 908-527-4996 or visit online at ucnj.org/county-clerk/elections.